A few months ago, I wrote about my experiences in Portugal and with European Portuguese. 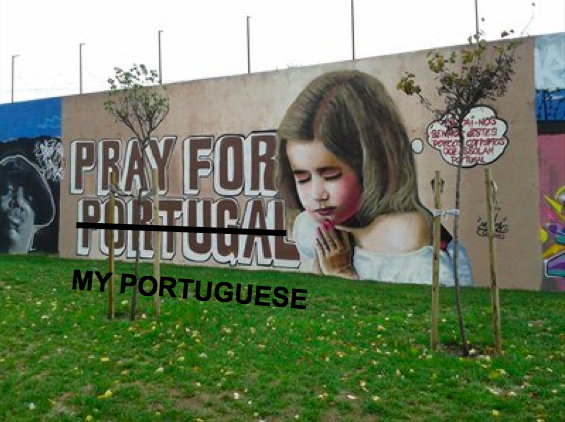 All in all, I told it like I see it, but as I spend more time in the midst of Portuguese people and their particular variety of Portuguese, I can’t help but see the writing on the wall (but perhaps that’s a bad idiom, since my problem is not with the writing, but rather the prosody*). Basically, it’s come down to the fact that I’m almost going to have to treat European Portuguese as its own language because, if I don’t, I’ll have to continue living in a country whose people I cannot understand. Try as I may, outside of small encounters (usually of the customer-employee kind), I find that I haven’t got a clue what Portuguese people are saying, most of the time. Even trying to pick out the topic of conversation has become a game of sorts, and one that I play badly, I must admit. The other day, I saw a Portuguese documentary with English subtitles, and by reading the subtitles, I knew almost every word being said in Portuguese. For the parts that didn’t have subtitles, my Brazilian girlfriend had to tell me in Brazilian Portuguese what was said on screen. Call it back-interpretation (after the term back-translation), if you will. Unfortunately, without such cues in real-life situations, I’m often at a loss. Have you ever tried to make friends with someone where only they could understand you? Not as much fun, I assure you. So what is it I’m going to do in order to remedy this daunting task? Listen, listen, listen…and find a local who is fluent in English and can work with me on my comprehension skills. Despite hearing European Portuguese every day, I don’t actually interact with Portuguese people every day. It’s a bit of a catch 22, in that I don’t interact much because I can’t understand them and I can’t understand them because I don’t interact much. The only way out, I’m sure I’ll soon be discovering, is through. The “worst” part is the knock to my ego (I never thought I’d say that!). Since I have zero problems with Brazilian Portuguese, I thought I’d march right into this tiny country and, within a month, I’d be back to the Brazilian-version of myself in no time (I subscribe to the idea that people create a slightly different version of themselves once they become fluent in and utilize another language on a daily basis). Back to the drawing board for me (brass tacks, I have an inkling what’s ahead of me will ultimately be easier than I imagine). It’s possible estou fazendo uma tempestade num copo d’água. Ponto de Encontro has great resources to practice listening comprehension. One thin you can do to have extended practice is go beyond answering the listening exercises from the workbook: Try to transcribe the audio dialogues. The review your transcript with someone who can give you feedback on it. We do that with our clients. If you have access to the online lab resources, you will find a transcript of most of the texts and dialogues presented in the textbook. It is also good practice to listen to the audio while reading the transcript. Then listen again without transcript. The trick really is to expose yourself to spoken Portuguese in any way you can. understand Portuguese spoken at native speed. I just read this while waiting for my final flight back home after 2 weeks in Pirtugal. You made me feel a lot better! I thought my Brazilian Portuguese was pretty good, but continental? Not so much. Like you, when I engaged someone I did just fine, but when I was “listening in” to other’s conversations, etc I could only get a little bit of the gist of the conversation, if that. Quite the blow to my ego…until I read this post. Thanks! Oi, Rob! I am glad that Adam’s experience “serviu de consolação” 🙂 Yes, spoken Brazilian Portuguese and Continental Portuguese sound quite different. Looking forward to hearing more about your trip!